"Writing a book can be a profoundly optimistic act; expecting someone to read, buy and publish it is always a phenomenally presumptuous one." I didn't know much about this book before I started to read it, except that after I reviewed How I Became a Famous Novelist, Greg from The New Dork Review of Books suggested I read The Thieves of Manhattan. Well, I'm happy I listened to Greg once again, because this book was awesome. However, most of the fun that came along with reading this book was that I didn't know where it would take me, so I'm not going to give too much away. kowalski n. A sleeveless white T-shirt of the sort favored by the character Stanley Kowalski in Tennessee William's A Streetcar Named Desire, in which he is depicted by the playwrite in one instance as wearing "an undershirt and grease-stained seersucker pants." daisies n. Dollars, from Daisy Buchanan, a character in F. scott Fitzgerald's The Great Gatsby, about whom Jay Gatsby remarks, "Her voice is full of money." This is a book for book lovers. Although this novel explores the lives of those who lie to get ahead, it is a testament to the modern human condition and just how far we will go to achieve success. 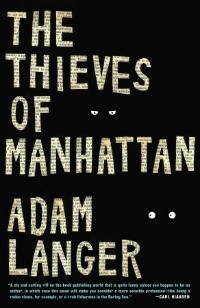 Truly a page-turner, The Thieves of Manhattan is fun, smart, and I can't recommend it enough. This sounds wonderful and I really need to read it (along with HIBFN). I especially love that opening quote. Red, I really don't think you'd be disappointed. I hope you get a chance to read it soon! Nice! Glad you liked it. 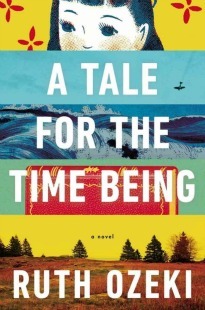 It was strange how it was really like two different novels in one, as the focus shifted at about the halfway point away from being funny and towards being a thriller. I dug it. And now, I'm going to go have a vonnegut. Cool! I love a book for book lovers in any form. This one sounds interesting and generally out of my reading norm. This looks really cool. You've been on a tear recently, Brenna. Greg, You're right is is like two novels in one. It was awesome. Andi, If you love a book for book lovers you'll really like this one! Glad to hear this one is worth a read. I've gone back and forth on it without being able to make a commitment. I desperately need a book that takes me on a ride, and I can fall completely into while reading. This one sounds like it would do the trick! Alex, What other books have you read with insider-book jokes? Just curious! Jenna, OMG I think this is it! I definitely love a book for book lovers. I've been attracted to the cover of it for a while, but I hadn't really read any reviews. Thanks for yours. LBC, The cover is pretty sweet. They incorporated it into the story line as well, which makes it even better. I came across this one at the library and picked it up because of the cover. So glad I did. Loved it. Definitely a book lovers book.